I've done a lot of small things to improve the overall look and feel of the game. Many are small annoying bugs I should have addressed a long time ago such as the "sliding" bug when a character walks over a small bump. Others focused more on visuals such as a host of small effects updates. Check out the new fire! Or the new Trap warning! I also took the opportunity to update the Waystones. OK so no one was too keen to carve their initials in the game. But these are still a huge part of Four Realms. So now they are spiffy and realm specific. It adds a touch of flavor and looks nicer. But hey getting a new spell is a big deal, a new stone is not enough. Gone is the rinky dink warning pop up when you get a new spell. Now you get a proper banner (similar to the new objective) plus a little audio fanfare. Aw, yeah, you win wizard! A bit of bad news. There is no plans for a Linux or Mac build of Four Realms in the immediate future. I thought I could do a simple zip file, but, well there's more to it and the time and money constraints put this out of budget for the game at the moment. My own personal computer died, so I lost a week of work. Ugh, indie dev means poor! But it ain't gonna stop me. I also took a moment to do as full a pass at audio for free as I can. I gotta say some of this stuff turned out great! It's hard to tell what you can get for free, but if you dig enough you'll find some good things. I have to give a big thanks to everyone who donates free audio. Obviously some of it will need to be replaced with licensed work. I'm looking at you animal babble/gibberish/talking effect. I found something close, but I don't think it quite works. But on the whole I'm quite pleased. And a huge thanks to Steven O'Brien. His work will be the music of the game. It's some great stuff that has a modern fantasy feel. Check out some of it now! Oh, and don't forget. All this good stuff is wrapped up in a new demo. As always thanks for reading and feel free to leave an feedback. I waited a long time before implementing generated levels. It was a bit of a mistake, but to be fair, I wasn't sure how to work it. I kept thinking about it but I kept stumbling when starting. I was making two big mistakes. The first would be solved with time. Four Realms is an odd duck of a game. I don't think until I hit alpha I had a great feel for how levels were setup and worked. But once I hit that stage I had the knowledge to break the levels in chunks. And that led to me realizing how to go about it for Four Realms. Basically instead of creating and eroding terrain and speckling it with flora ala procedural. 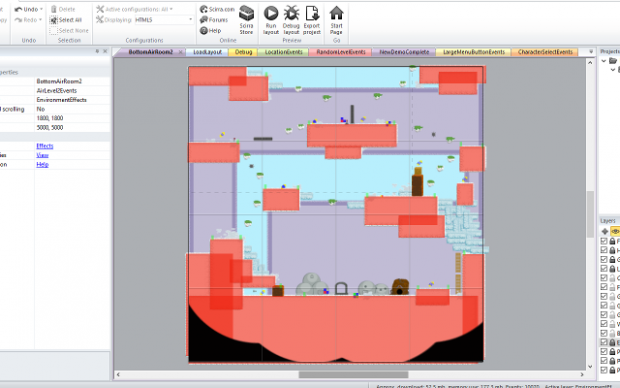 I just create rooms that simulate game levels and stack them together. Here you can see two of the rooms, 1800x1800 pixels. 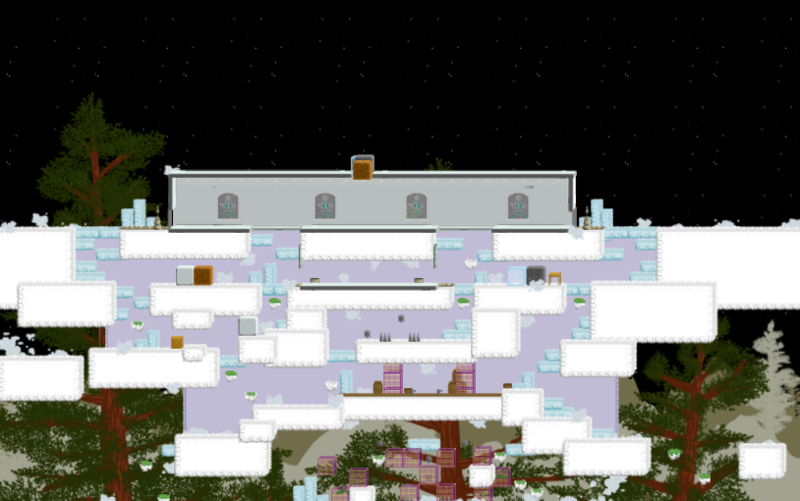 Each room contains about 1/6 the stuff in a normal level. The generator grabs six of them and stitches them together. It's admittedly a "big brush", but I find this does pretty well for creating the good paths you find in Four Realms while still creating a random unique level. Then the generator takes these pieces to and uses some heuristics to make each different for each realm. It skins each level appropriately to the realm and only uses rooms from the current and adjacent realms. Rooms are also broken into top and bottom categories. There's some more random bits to it than that, but that's the essence of level generation in Four Realms. The level generator was a bit buggy and needed more work than I hoped, but I did find time to add one new feature. Secret Rooms! Any creature that can see invisible objects will see through these and find new paths. As always, thanks for reading. All feedback, questions, and suggestions are welcome! As you may have noticed Four Realms got a make over. OK. A lot of this is marketing stuff, but it helps the game look better too! 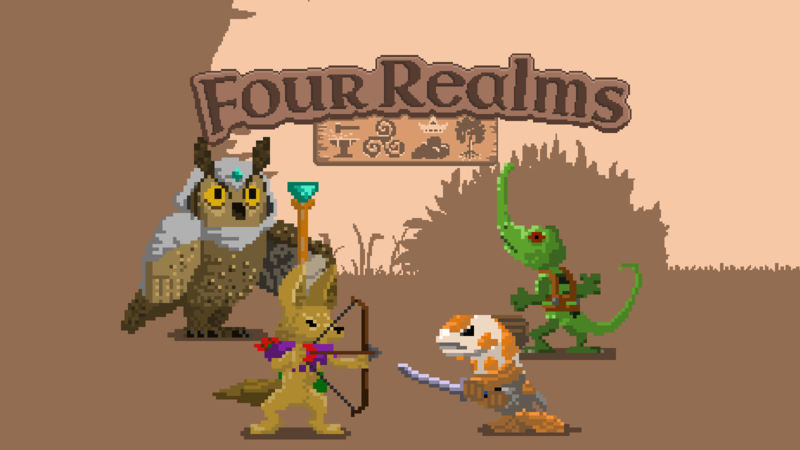 Check out whats new with Four Realms. A small update has been done to the SFX. Just replacing a few missing sounds and a few of the rougher sounds. The text has also been updated to be a bit less goofy and more in line with the final game. These changes as well as the new logo are in the latest demo! I finally update the logo, ugh it was bad. But the new one looks quite a bit better. I'm no pro graphic designer, but it works. I took heavy inspiration from the Animal Crossing and Hearthstone logos. A nice woody and thick thing that pops out. I also kept each realms emblem. I think it's nice touch. And with a new logo comes new box art. I really like the brown on brown complementation that is really striking and highlights the characters. Hey, if you have a new logo, you should probably make a new trailer! I know it's not some awesome Hollywood style thing you see with other games, but I feel it's a huge improvement over the last trailer. The last one tried to sell the story too much and took to long to get the meat of the game. This one is more like a gameplay snippet and shows whats so awesome about the game. And yeah, I plan to do one for each of the Wardens, so keep your eyes open! If you haven't yet been, check out the Hugebot! website, it got a clean it up too. Lots of new gifs and pngs for those that like to ogle the game. Also, if you are really interested in the nitty gritty of gamedev, check out the Greenlight Post Mortem. As a side note I'm happy I got this update out in less than a month, I'll do my best to increase this trend! Thanks as always for reading. All questions, suggestions, and comments are welcome! The final set of items have been added. Seven new pieces of equipment and a few updated or changed. The biggest additions are shields. I wanted a little more development for the Warden throughout the game as well as a bit more ability to customize the look. So, I added the obvious equipment slot, shields. Since blocking has become a primary action I decided it need a little more love, so when a creature blocks it becomes almost like a parry, stunning the opposing beast for a few frames and leaving a brief opening. I like the addition, but it need a little tweaking still. Now, not all items for the slots are shields. 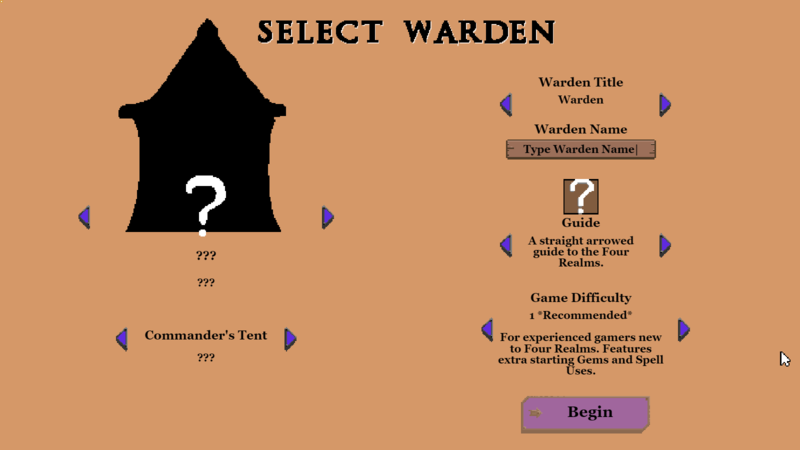 The slot essentially sets the right click action for the Warden, I decided to take advantage of that so there are a few unique and different items for you to discover. 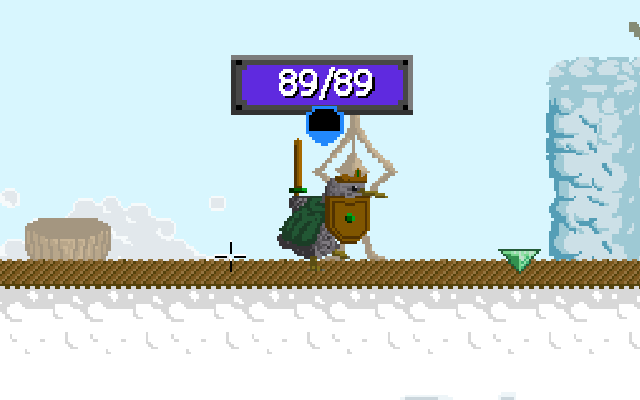 In addition to shields, the classic scepters have been turned into swords, cause you know it's what you want! And that brings the total items in game up to 52. One more skill has been added bringing that total to 14. For those that haven't tried the game yet, tents are ways of adding a secondary skill to your Warden. Five new tents have been added to the game, all unlockable by completing the game either with various difficulties or different Wardens. I'd tell you more, but I don't want to spoil the discovery. 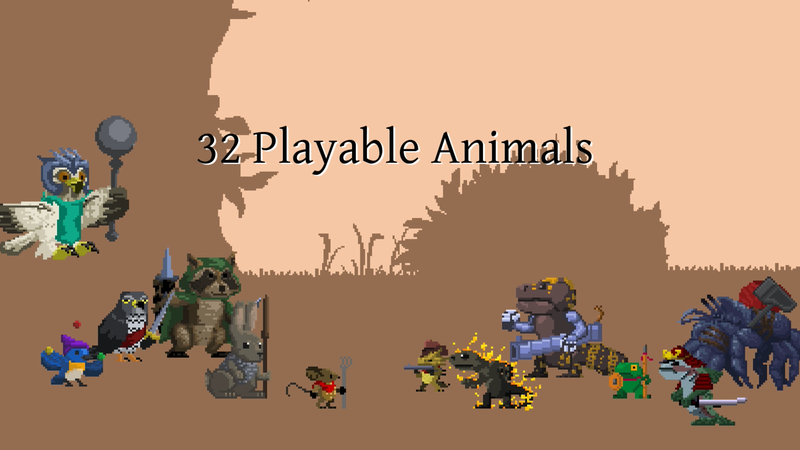 Also the final two guides have been added to the game, these little guys change up the dialogue in the game to add variety on multiple playthroughs, this brings the total of those up to four. Eight more rooms have been added to the Level Generator mix, bringing the total to 24 for a large variety of layouts while playing the game. And what's the fun of more levels without corresponding missions? Two more missions have been added that now feature beasts corrupted by the Wild Magic. This brings the total missions in game up to 36. Check out the new hats! You may have noticed on some of these I've said final count. That's right, this is final push towards beta and early access. Those of you waiting to play the full game, it's coming soon! Now I say final, but the game is designed to be expandable, so if there is time to add more during beta I most assuredly will. Now let's look at those tallies! Guess what I'm working on next? As always, thanks for reading. All questions, suggestions, and other feedback is welcome. PS: Sorry, no updated demo, that'll come after the content push. Yes, the final two Wardens are in! (Sorry, not available in the demo.) 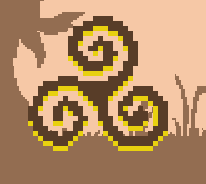 I've revealed what they are but I'll save what their specialties are for when you get to try them in game. Without further ado; here are the Guinea Pig and Spotted Kiwi running! I've also added two more Exploration levels, one for the Water Realm and one for the Earth Realm. 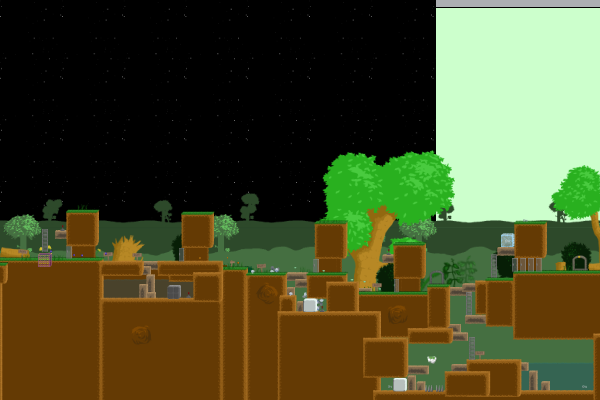 Earth Level 5 one is a fun tromp through a city of trees. Water Level 5 is a swim in to the depths of a great lake! 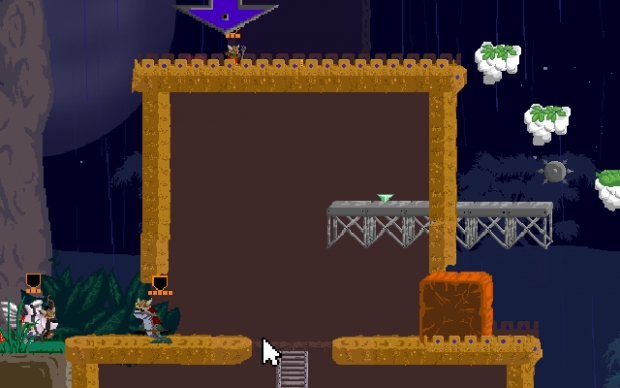 In addition to two levels there is one more mission for the Exploration Levels. 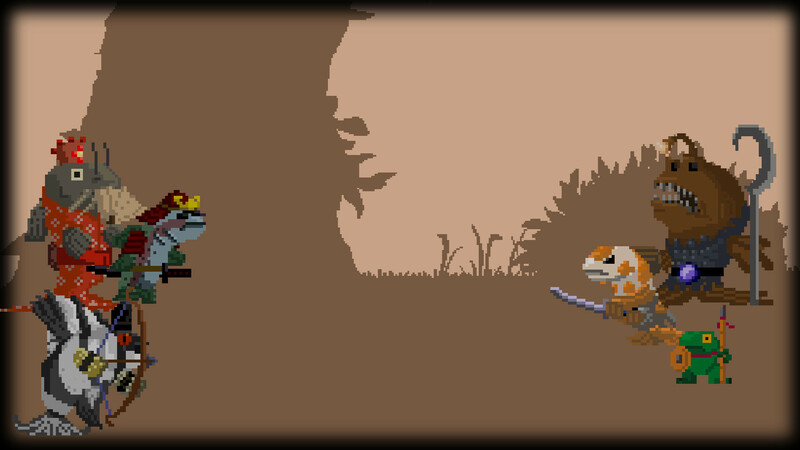 Much like the last two levels added this one focuses on battling the Wild Magic. I suspect most people don't know how the levels work in Four Realms and the demo is not the best indicator, so for those interested in the nitty gritty details here's how it works. Levels are a random combination of a layout and a mission. 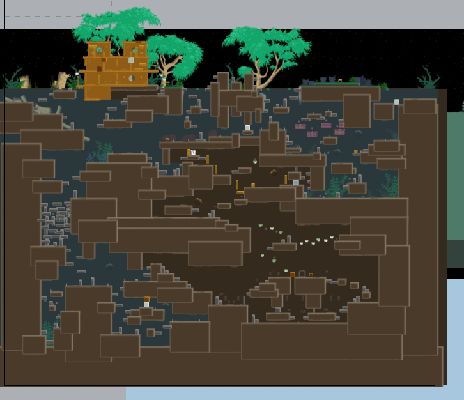 The layout of course being just how the level looks and feels; big trees or on a desert. The mission is what you are doing there, rescuing lost eaglets or proving your worth to the locals. Since it's a combination of any layout and any mission. That means when you play the game a second (or third or fourth) time, even if you see the same layout or mission, the same combination is unlikely, creating a unique play through every time. But wait there's more! In addition to that there are three types of mission/layouts. 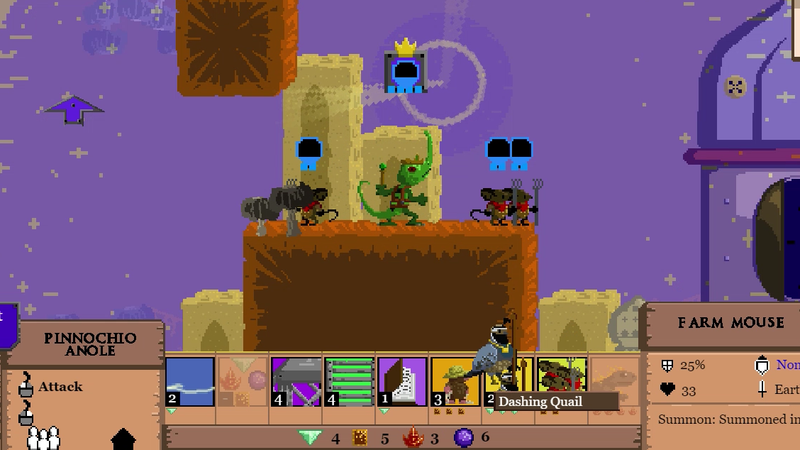 Adventure: Adventure levels are the more standard levels in Four Realms. They contain a healthy mix of action, combat, exploration, and puzzles. These are what you will see most often. Assault/Defense: These levels are smaller in size compared to Adventure levels, but this leaves room for more combat! Exploration: These levels are larger than Adventure levels, these ones are intended to focus on puzzles and exploration. This is the type of levels that I've just added in this pass. But wait, there is even more that that! Some levels are hand crafted by me to create a sense of place and adventure, those are what I call the Unique levels. All Assault, Defense, and Exploration levels are unique, and so are a few Adventure. 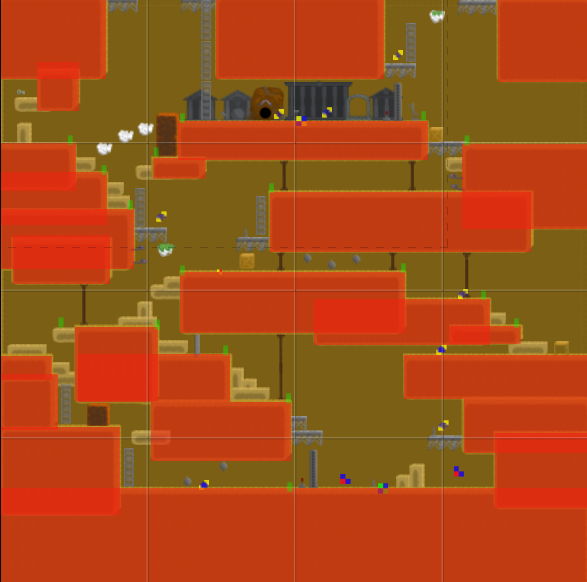 Some levels are generated by stitching together some rooms (see the last couple of posts.) 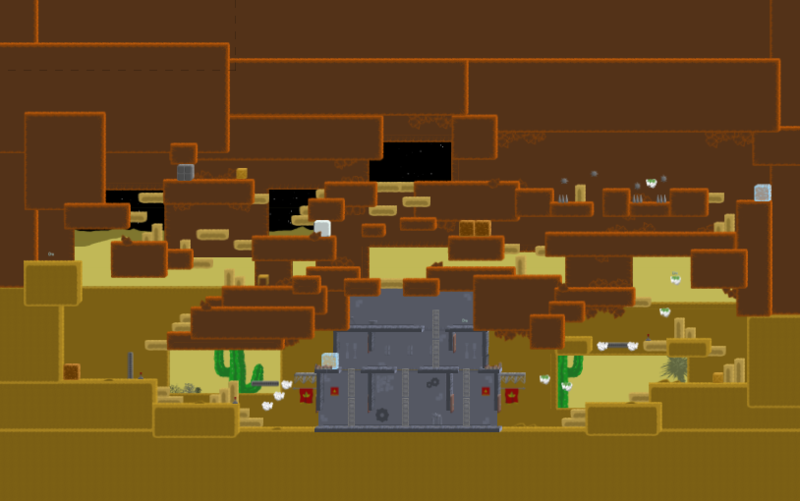 Only Adventure levels are created like this. Generated levels will make up about half the content you will see. OK, if you've been following along yo know I'm pushing to get the game into Beta phase. But the last missed something that I missed the last round, I have to polish end game content. So to be spoiler free, you won't see much in the form of a post for awhile, but don't worry, I'll be hitting up the final list again shortly. Here's the list as it stand now. As always thanks for reading! All questions, suggestions, and feedback are welcome. I had to spend a bit of time cleaning up the end game. The Wild Magic enemies now have new animations and the Wild Magic itself got a bit of spring cleaning. Here you can see the new Wild Magic, gone is the ugly yellow! 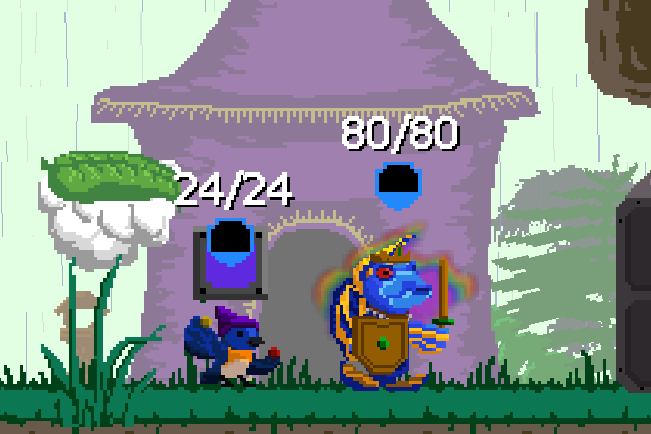 And here is a peak at a Wild Magic enemy! It's weird, I know, but I like it. 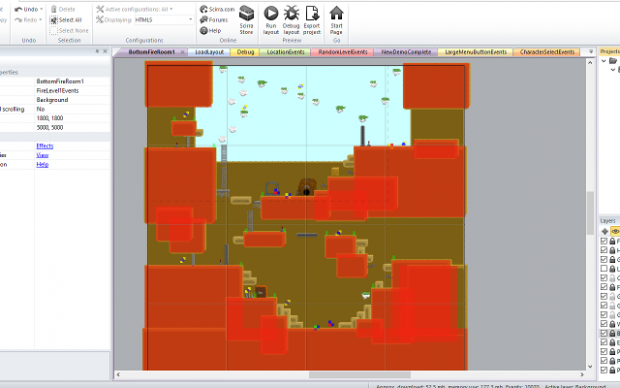 I also added a few more final level missions and let the final level pull from the Level Generator. 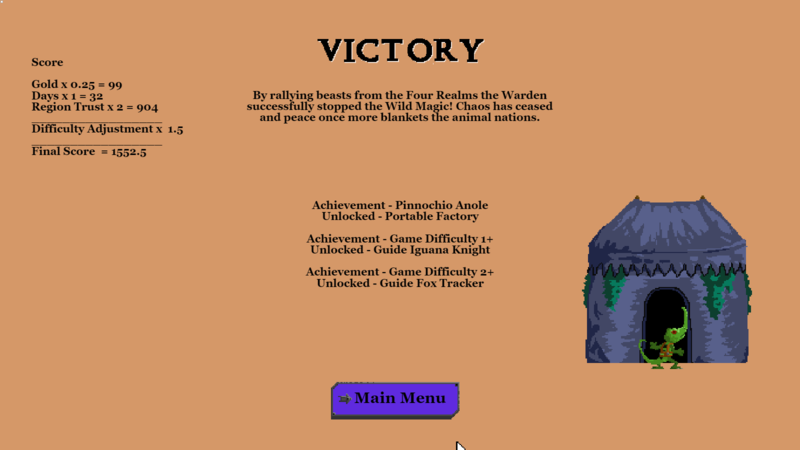 In addition to sprucing up the ending levels, I added a proper victory screen! It now tallies up a score for those who want to improve and it features unlockables! [p]If you read the last post I detailed all the variations that can go into a level. 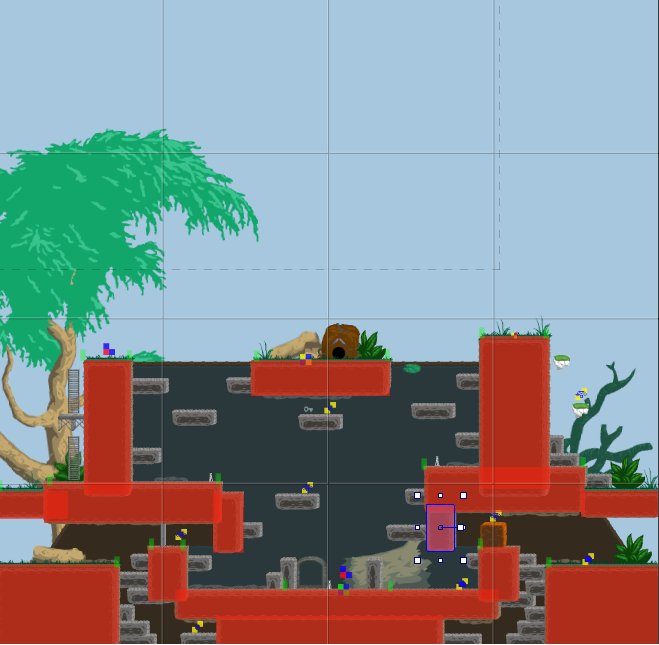 Well, here are the final two Assault levels for those who want more action! The first is Fire Assault Level, a fortress buried in a mountain. And here is the Air Assault Level, a temple atop a giant cloud! [p]In addition to that, I've done a touch more bug fixing and polishing. Invisibility is fixed and the object info board lines up correctly. 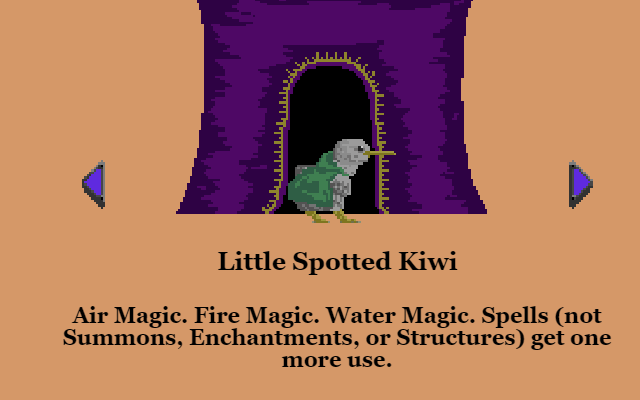 One sad bit of news, the Little Spotted Kiwi will not be immediately available in Early Access. It turns out the power I gave it was way too strong! So, it's out for now, but never fear, it will make a hasty return! 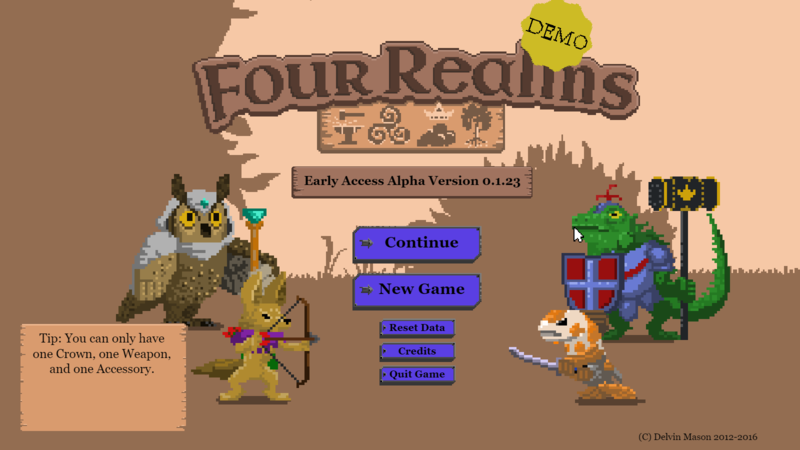 But on the plus side I made a main menu that features the Four Realms box art. The short answer is, almost, very nearly, yes! I'm considering this build Early Access 1. I just have to work out the details. In a few short weeks you'll see the game on Steam, itch, and hopefully a few more distributors. So keep your eyes open! It's finally almost here! Now everyone can check out the full game, it's entering Beta, so yes there will still be bugs, but it's pretty stable. The game will be available on Steam and itch.io. The starting price will be $7.99 and will increase gradually throughout Early Access. To help promote the coming Early Access phase there is a new trailer. You'll notice it's similar to the last one, which I thought worked well. Hopefully those interested will watch both and see what can make this game so awesome! Requirements: Windows. 2Ghz. 1GB RAM. 200 MB disc space. Price: $11.99 with a 33% Early Access discount. As always, all suggestions, questions, and feedback is welcome. Yes, now you can play the whole game! There is a caveat or two though. First, this is Early Access of the Beta stage of the game. There will be bugs. I highly recommend you try the Demo first to make sure you don't have any large technical bugs. If you do find issues, please, let me know. I can't fix what I don't know about. 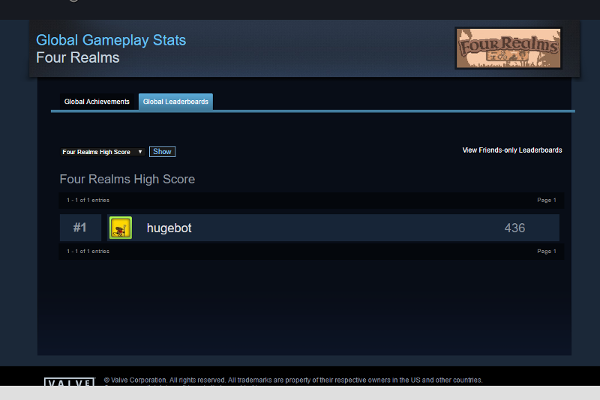 Second, if you are unaware, Hugebot! is a solo garage game dev team. What does that mean? I'm one person, so cut me a little slack. And I'm not paid big bucks (or anything at this point), so, I have a day job. My time is limited, but I am dedicated to making Four Realms awesome. Just be patient and I'll do my best. A third Warden trailer! Seriously, check out all three in succession. It will give you a great feel for the variety of game play you can find in Four Realms. This one features the Guinea Pigs. They are a bit more advanced. Their specialty is you actually get two Wardens. So pile up those Skills and Items to double their effect! Or bring out a Shrew Flag Bearer and get double the benefit. As always, all questions, suggestions, and feedback are welcome. A few optimizations were added. Mainly a bit of trimming to Level Generator rooms and some text database optimizations. 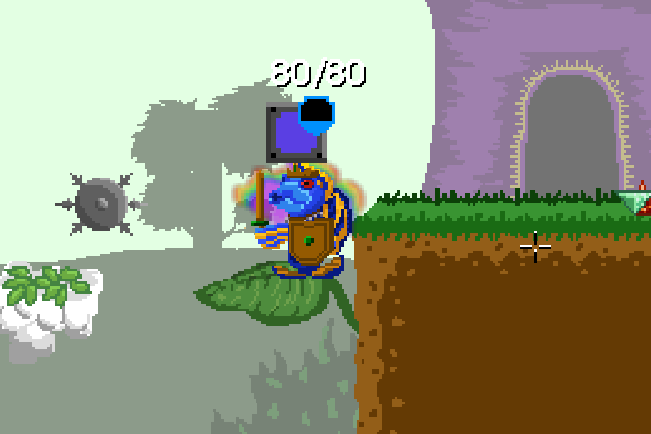 Also, a few minor bugs were fixed such as blerbs being broken from the new HUD and a few collision issues. One bigger bug of Scaffolds not working Generated levels has been fixed. Also Events no longer require a minimum of one day. Making the game a tad easier. I also did a few more tweaks to make the easier difficulties a even easier yet. Your Warden now starts with a health boost. 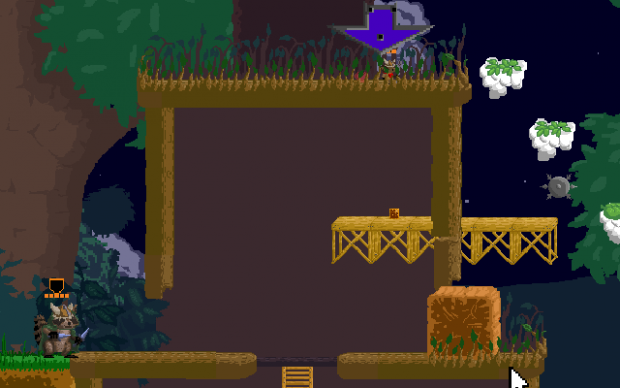 Also, all environment platforms (Rain Leaves, Sun Flowers, etc.) are always on for the easy difficulties. 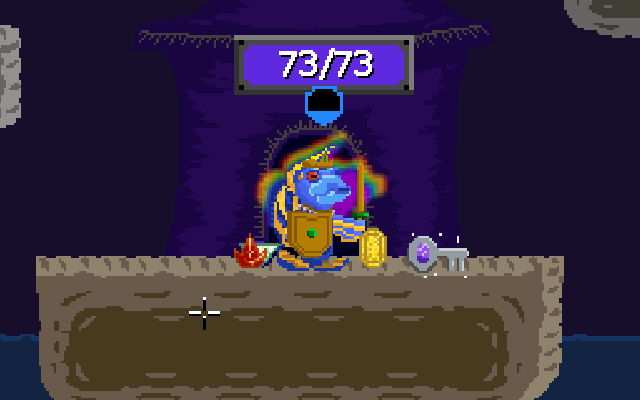 Several players have suggested using numbers instead of bars. So I've implemented it. Let me know what you think! Here is a before and after shot. The biggest thing I've noticed is players not using Spells and Allies, which is the core of the game. So, I've expanded on the tutorial to really emphasize this. There are two more sections and several more tips that point players in the direction of utilizing allies more. Play it and let me know if it helps. Also created a few tips signs to make the finer points re-readable. And Four Realms has it's first review. A big thank you to Kayla from Elo Talk for trying the game, sharing it on Twitch, and posting a review. Thanks for reading. All questions, suggestions, and feedback are welcome. Most are the standard run of the mill "beat the game" achievements. 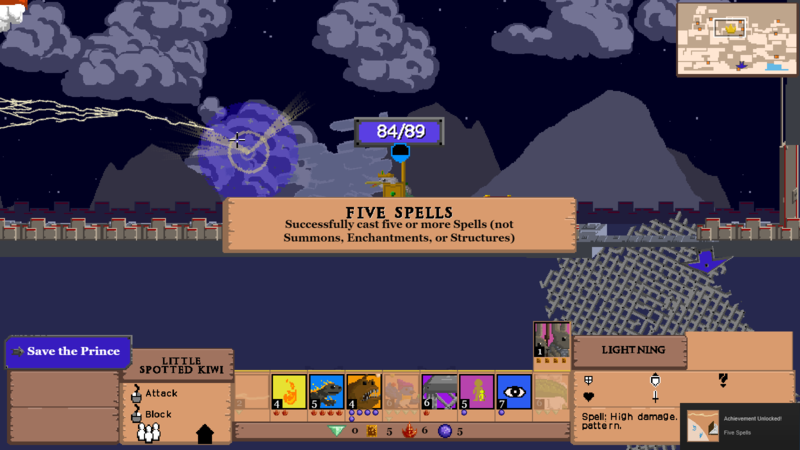 But I have added a few others to encourage players to really use those spells. There are 18 now, but I'm more than happy to add more. Let me know if you have any ideas! Most of the unlockables have technically been in the game for awhile now. 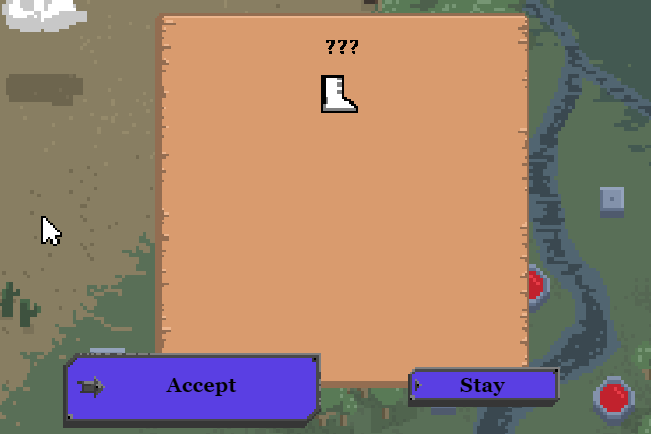 Have you been wondering why there are arrows next to the Guide and Tent? Well guess what? 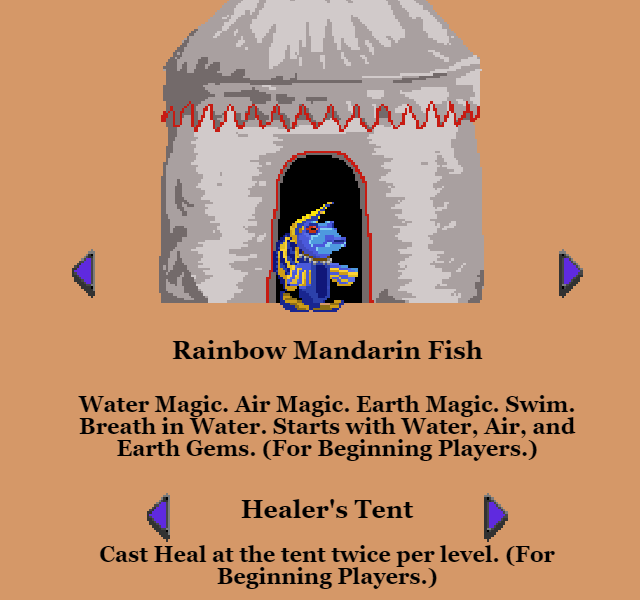 Beat the game with various Wardens and difficulties and you will unlock new Tents and Guides to spice up the game. Note: Difficulty five doesn't currently have a reward ... yet. But that's not all, some of the achievements also unlock new Titles. Tired of being called Lord, Lady, or Warden? Then earn a new name for yourself. How about "Commander"? OK, so most people didn't know it was gone. I implemented it and wanted it live on the start of Early Access. Only, when I was playing it right before going live, I found the Warden to be way over powered. The original power reduced the costs of Spells (not Structures, Summons, or Enchantments) by one. You could essentially cast those powerful Fireballs & Lightning Bolts for free and save up for big allies. Now the Kiwi adds just one use to the Spells. I was hesitant to do this at first since the it seemed less powerful than the other Wardens. Oh, silly me. I think this one is just right, let me know what you think. 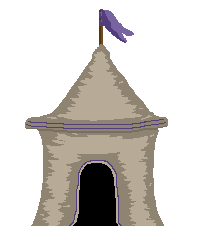 Since I revamped the Kiwi, I also had to revamp the Arcane Pavilion (the tent unlocked when you beat the game with the Kiwi). Now it increases your max Spell List size by one. Now that we have the full four Wardens. Which is the one to choose? The obvious first choice is the Rainbow Mandarin Fish. Flexible and easy to understand, those extra gems come in handy. But while flexible, this Warden is not necessarily the strongest. The next early pick is the Pinnochio Anole. While not as obvious as the Mandarin Fish. Load your list up with structures and you'll find you get a lot of more bang for your buck. The Guinea Pigs are definitely where we enter into the intermediate zone. They clearly get a strong early bonus of an extra ally per stage, so it's not bad for beginners. But their real power comes when you understand how to maximize Skills, Equipments, and Tents. The Kiwi is certainly the most advanced of the Wardens. It's potential doesn't shine until you've unlocked enough Spells. Then you can cleverly leverage some powerful spells to easily turn the tide. As always thanks for reading. All questions, suggestions, and feedback is welcome! I've still be recieving feedback of confusion on the game. Believe me, I know the game is different, that is very much intentional. But good news! The tutorial section is now almost twice as long! I've tried to keep the earlier tutorials focused and repetitive of similar facts. Hopefully, this will let players get a good feel on the nuances of the mechanics. Then there are a few more sections that ramp up in size and let the player play with their new spells. Using Steam4C2 has opened up the possibility of leaderboards, so, I figured, why not? Now you can compare your best score versus your friends! Unfortunately I can check for cheaters, so this is currently a friends only leaderboard. This one has be asked for by several Steam players, so, here it is! Trading Cards come in sets of Wardens and Realms. There are then the unlockable badges of various levels. And of course the rewards of various emoticons and profile backgrounds. There is a background for each Realm and emoticons for each gem type and guide. And of course there have been a few bug fixes and polishes. Player light should not shudder. Thanks for reading. All questions, suggestions, and feedback are welcome! 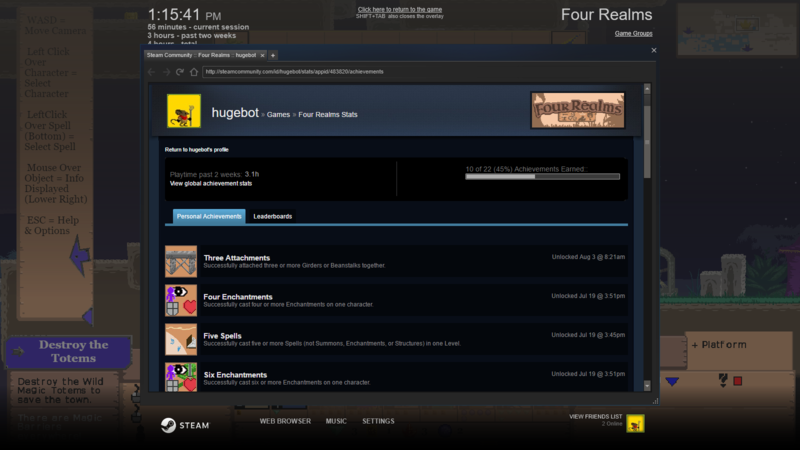 Four more achievements have been added. Each one attempting to teach the players the nuances of each spell type. One such one is Enchant Enemy. 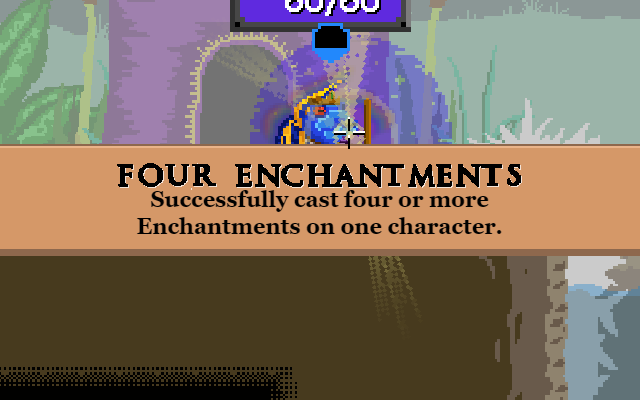 Sure, you can enchant yourself. Even allies. But the fun comes when you learn to debilitate your enemies! Of course, what's a new achievement without a title! I also added this handy achievement button to the main menu so you can track what achievements you've achieved as well as their rewards. For those brave enough to complete difficulty five, there is now a new reward to unlock. The reward is well worth the effort though. Good luck! I spent a bit of time touching up the tutorial just a bit as well as a few other additions. Now return to camp is a button and not an alternate attack. Hopefully this will be easier to learn and remember for players. Missions now have a split for difficulty. Harder missions only show up on harder difficulties. The Steam overlay should now be working properly (thanks MadSpy). As always thanks for reading. All questions and suggestions are always welcome! 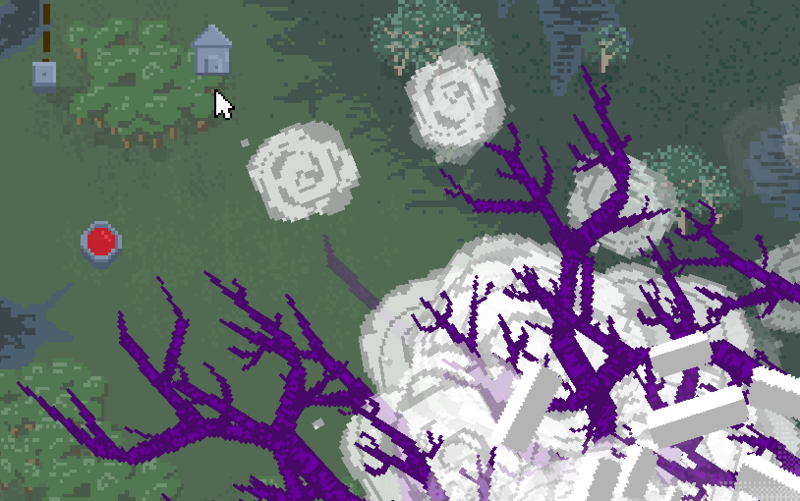 Oh, and I added bubble effects. Bubbles!!! The first pass of gamepad support is in. I've tested it with a 360 controller and it seems to work pretty decent. So if you like gamepads on your PC games, give it a go and let me know what you think. I'll start doing some tweaking with it in a few weeks. Having only one tent to choose from at the start felt cheap. Sure there are quite a few to unlock within the game. But I wanted to give the players a few more choices to start. So I've added the Healer's Tent. It lets players cast Heal twice from their starting camp. I think it's a good option for beggining players too. As always: all questions, suggestions, and feedback welcome. These are always the funnest updates and I've been working on this one in conjunction with the gamepad support. Four new Summons, one new Enchantment, three new Structures, and four new Spells (Conjurations)! So back when running the Kickstarter I got called out for only having "cute" creatures. While this was kind of subjective and possible false (hey, I don't think snakes are all that cute), they did have a point when they pointed out that there were no spiders or slugs. Well, guess what? That's right, now you too can summon more bizarre creatures. This update includes four new summons: Pirate Macaw, Nephila Architect (Spider), Crab Battlemaster (Coconut Crab), and Giant Snail. Going wider means adding new features. Now there is also a new ability some characters will possess. After all, what's the fun of a spider if you can't climb walls! As a side note, I'm a bit arachnophobic, so I hope you all enjoy the beast. So there are already a lot of Enchantments in the game, so I reigned in my enchantment love and added only one, Earth, to round out the elemental enchantment set. Structures get a good bump. Now you can build Turrets, Barracks, and Keys. 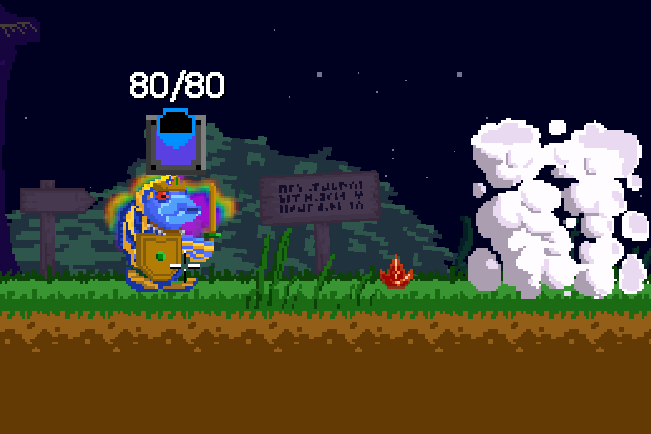 Adding some flavor beyond just platforming elements to the spell type. Spells (Conjurations) get the biggest bump with four new instant creations. Boulder and Ice Blast round out the launchable element set. 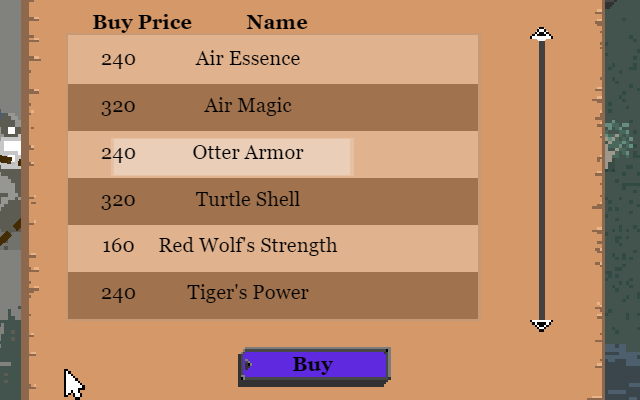 And the addition of Alchemy and Persuade add some interesting twists to what player can do in game. I'll be detailing half of these new spells in upcoming blog posts, so keep your eyes open. 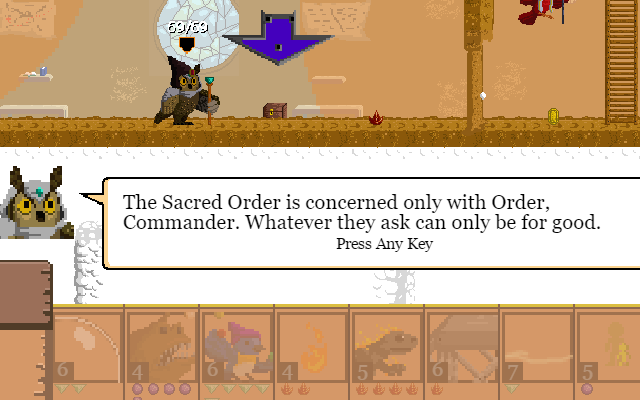 Or ... jump in the game, unlock the new spells, and see what you can do! As always, thanks for reading. All questions, suggestions, and feedback are more than welcome. And for fun, let's look at content tallies for the game. This build features a lot of fixes and goodies to tune up and make the game feel and look better. 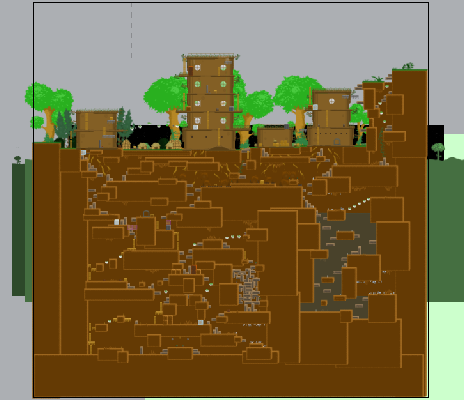 Generated levels get a spruce up to be more consistent looking and elemental barriers are now consistent. 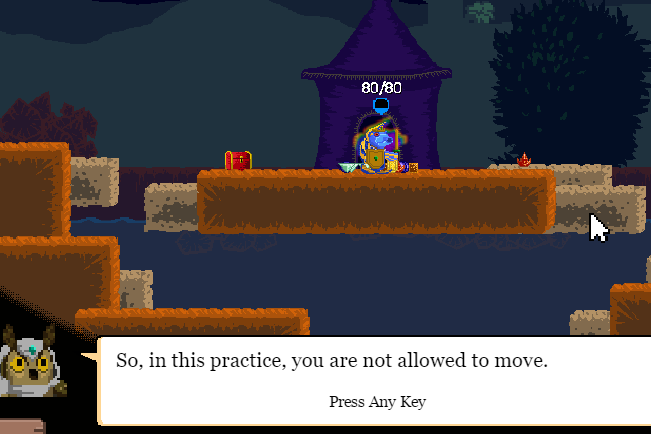 Generated Levels Door, Stones, Environment Platforms now have proper sway and Armor. Background Tint Generated Levels not matches Night/Day. Walls on Water Generated Levels. Combat gets a few annoying features trimmed and a few fixes for consistent damage. No more Fire/Water damage ailments. 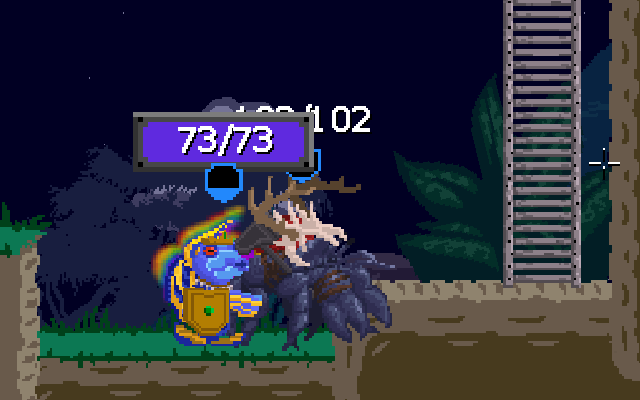 Knockback can damage after animation, but no knockback for a period. Thrown attacks can now reach their target. Neutral Characters can now be damaged by enemies. Fire Salamander maintains distance in combat. Load text on every game load. Wall climbers don't push crates forever. More pizzaz to dialogue boxes. Aether Angel not stuck on player control. Memory spell highlights appropriately, doesn't lag, and exits faster. Made Viking and Hypnotist hats less silly. ^LocalRegion Trust shop now show region. Tool tip is now not significantly laggy. Fixed lag on character select screen. Sell doesn't unequip if you have two items. A lot of the tuning went to the super game. Items and bonuses you can buy are now cheaper. Trust is easier to earn, making the whole game a bit easier. Plus a few features to make the easier modes easier. You now start with a key on the lower difficulties. Added Combat Tutorial (Use Allies). More Days on easier difficulties. Earn More Trust/Days on Level Complete. Start with one key on easier difficulties. Lose less Trust on final mission failure. Allies magnet towards player when jumping. Warden can call allies to position with alt attack. One new feature I want to highlight is that you can now summon allies to your Warden's location by pressing shift once, switching your attack to "Call". As always, thanks for reading. All questions, suggestions, and feedback are welcome. Another round of polish has been added to Four Realms. While there are a lot of small tweaks and fixes in this build, there is one thing in particular I want to point out. Mid Mission saving! Stuck in that long mission. Well, now you can save when you want and continue the journey at your leasure! Characters and Spells can no longer be cast into walls. Fade in Attack text on switch, no more effects. Removed lagging crate arrow in the tutorial. Round Armor on Info Board. Equipment no longer shrinks when closing menu. New hat for Metal Heads (Bucket Heads). Medium Air Barracks placed higher in Generated Levels. Adjusted moving platforms to be better timed. Reload spell info on load game. A bunch of level tweaks and fixes. Can't pick up Gems and Gold when Warden is Returning. Can quit to menu from mission. Can't destroy invisible ladders in tutorial. Adjusted line-up, Call, and portals in tutorials. 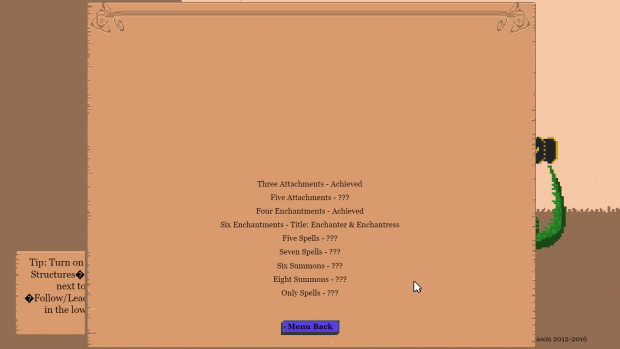 I also spent some time tuning the new balance of spells. Certain spells now no longer affect Objective targets. While I try to keep the spells as flexible as possible, these ones just ended up a bit too powerful in these cases. A pass was also done on the text. Various mistakes were fixed and a bit of fine tuning was done on the overall tone. Less chance of gold from Pirate Macaw. Tangle, Freeze, and Charm only work on non-Objective Targets. Increased the cost of Charm. Infoboard pulls from title database for enchantment names. Damage effects only spawn one effect. Hats only updated for on screen characters. 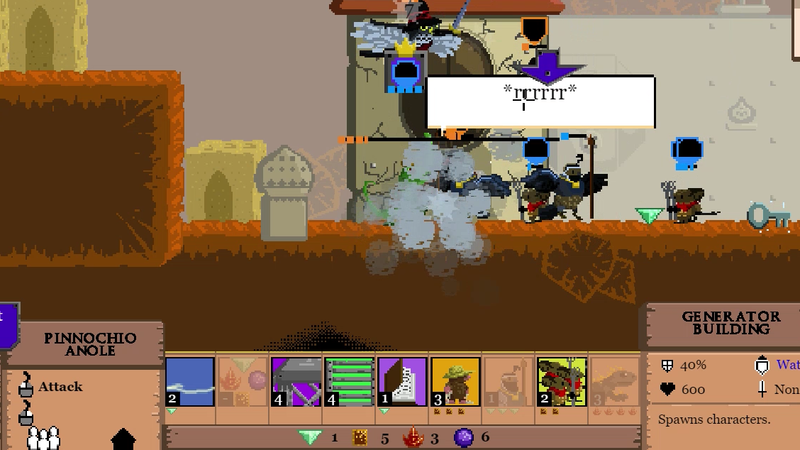 Enemies properly follow on ladders. Warden attack has a more accurate range. 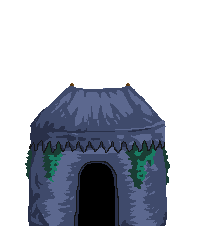 Fortune Teller Tent text added(For Experienced). Changed 'Vikings' to 'Barbarians'. Changed 'Bucket Heads' to 'Metal Heads'. Fixed missing ^Aether tag in Events. 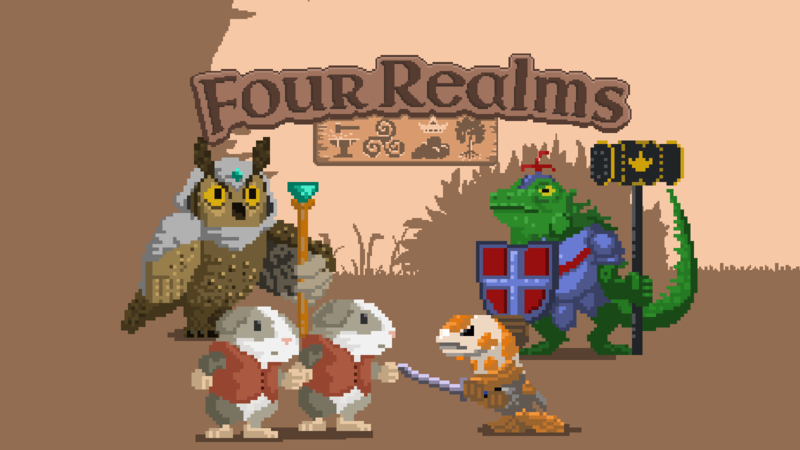 And if you just can't get enough Four Realms goodness, be sure to check out the blog. You get more insights in the development, plus detailed looks at the Spells of the Four Realms. Two recent posts look at the Nephila Architect (a character that turned out way cooler than I expected) and four of the new spells in the game. As always thanks for reading. All questions, suggestions, and feedback are welcome. There are a few remaining minor bugs and handful of AI issues I want to work out. If you know of anything I've missed, please feel free to leave a note and I'll take a look at it. I look back at what is in the game and what was on the initial content list, and I've got to say, wow! About 75% of the planned content made it in. While some stuff didn't make it, many new features got added like Tents and Generated levels. Right now I'm focused on polishing out those last few kinks. Do you want more Four Realms? Then let me know, tell your friends, share video, share pics, and support the game! Yay! After four years it's finally done! Check it out! It's Awesome! I want to give a big thanks to all those that provided feedback and helped make this game possible. That's right this isn't just a ceremonial moment. There are new things in the game since the last update. I focused primarily on bugs, specifically I rounded out some of the rougher edges of AI. Here's list of the random bugs that were fixed. Changed LOS to whole target. Enemy damage doesn't damage neutral objects. Removed unneccessary floor state AI checks. Enlarging and shrinking moves health numbers. Help Box stays off in later tutorials. Blue Bird attack has less range. Flattened out terrain for better combat in Tutorial 1C. Unlockables are shown on character select screen. Fixed Portable Factory not working. Enemy Camp mission completes with ally Barracks. Oh yeah, and now you can see what you are missing from unlockables. Beat the game and see what else it has to offer. You didn't think it would just be bugs did you? No! 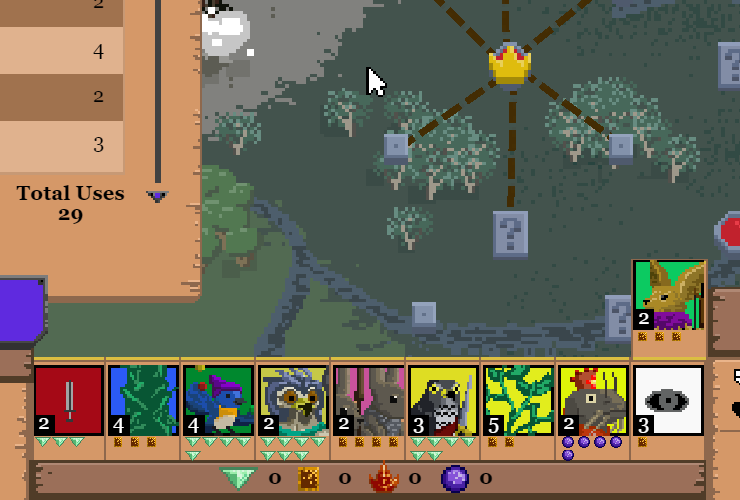 There are eight more spells to find in the game: Small Portal, Prayer, Flag, Spikes, Vertical Spike Ball, Nature's Bounty, Curse, and Sticky Paws. That's four more Structures, two more Spells, and two more enchantments. Check out Small Portal in action! I try and make most spells multi-purpose in nature, but Curse was a special surprise. Curse a door and you can bust it down, how handy! Alright, so if you've watched the trailer you've seen it, but here's the final spell counts! That's 80 total spells for you to unlock! Which reminds me, there are two more achievements in game now, one of which is getting all the spells, so what are you waiting for, go play the game!